Get organised and be ready to enjoy these hot from the oven. They really are delicious. Heat the butter and olive oil in a large pan. When they are hot, add the onion and fry gently until translucent. This will take about 10 minutes. Set aside. Preheat the oven to 220oC/425oF/Gas 7 and grease a baking tray. Sieve the flour and baking powder into a large mixing bowl and coarsely grate the chilled butter on top. Dip the butter into the flour to stop it sticking, then add the grated Cheddar and rub the mixture with your fingertips until it resembles fine breadcrumbs. Add the egg, chives, yogurt and cayenne pepper. Mix until the ingredients come away from the sides of the bowl. Transfer to a floured surface and knead lightly. The mixture should be soft enough to handle. The yogurt can make the mixture sticky so don’t be shy to add more flour if it is too sticky to handle. 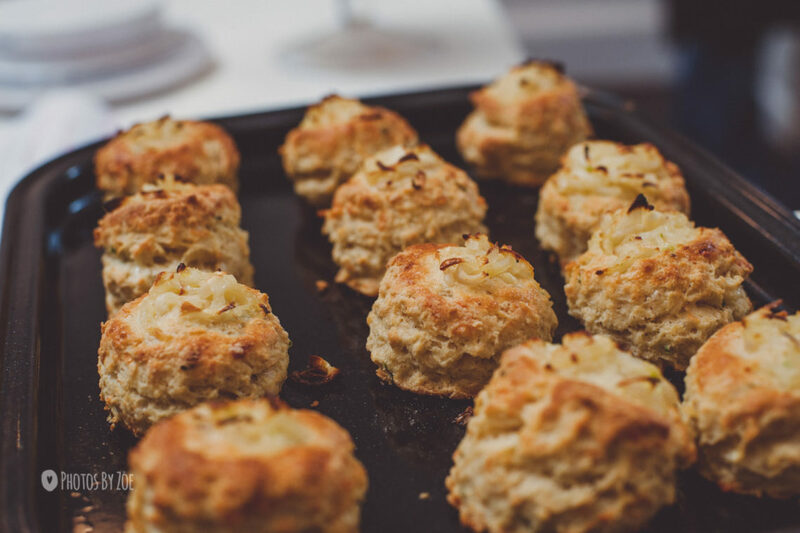 Roll out to about 2.5cm thick then use a small scone or biscuit cutter to cut out the scones. Place on the greased baking tray, brush with the egg wash and sprinkle with the fried onions. Bake for 10–12 minutes until risen and golden.